The Royal Military Academy Sandhurst has appointed the first female college commander in its history. 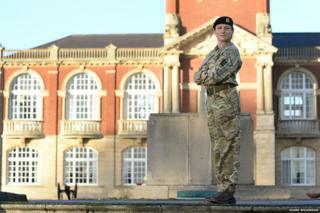 Lt Col Lucy Giles, 46, will be at the helm at New College to help prepare young British Army officers for their chosen regiments. She said: "I have to pinch myself really, because it's an enormous privilege to be in this unique position." The academy was founded in 1947 after two older military institutions merged. Lt Col Giles from Wincanton, Somerset, will oversee the academic programme and the physical training aspects of the intermediate and senior terms of the course. The married mother-of-two said: "It's interesting to see people's reactions in this traditionally male environment. I'm a mother and wife of a soldier, so I am bound by juggling those domestic considerations as well as delivering a day job, so to speak." She said she would "lead by example" and encourage permanent staff to "try and make time for their families". She spent two years as the first female Officer Commanding at 47 Air Dispatch Squadron. She said: "I like to think I was boarded for this appointment because I had the right key skills, knowledge, and experience to be able to do this effectively, as opposed to me being here because I'm female. "Although, I recognise that being in this position means I may come across as a role model for our future female officers." Famous royals to have trained at Sandhurst include Princes William and Harry.